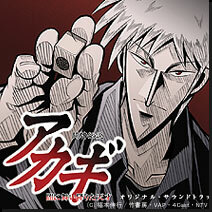 Akagi (アカギ, Akagi) is a Japanese manga written by Nobuyuki Fukumoto about Japanese Riichi mahjong. It is featured in the weekly magazine Modern Mahjong, and has even been adapted into two live-action movies and a 26-episode anime series. Akagi is also featured in Fukumoto's prequel series Ten. Its popularity has also spawned a spin-off manga Washizu: Enma no Tōhai based on the early life of Washizu Iwao, merchandising of transparent tiles, as well as games on the mobile platform and Nintendo DS. The story takes place 13 years after World War II where thirteen year old Akagi Shigeru takes refuge in a mahjong parlor in Midori in order to flee from police officers. Here it is discovered that Akagi is a unnatural genius at gambling and begins to outwit and outplay the Yakuza, seasoned professional players. 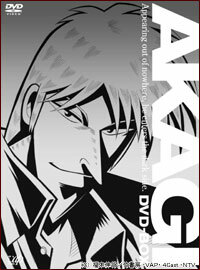 Throughout the series Akagi tests his wits against several opponents, each time raising the stakes on the line. A 13-year-old amateur at the game of mahjong. He survives a game of chicken by lateral thinking. Akagi is introduced as a deceptively adult looking young boy, whose spark of genius transcends age and resides in gambling, especially in the game mahjong. Throughout the story, Akagi utilizes techniques other gamblers don't dare to, in order to sway his opponents: brazen cheating, extremely risky maneuvers, far fetched bluffs, a blatant disregard for his own life. A gambler who carries a large burden and debt. He gambles with his livelihood on the line. He lets Akagi proxy for him where it is discovered that there is more to Akagi than meets the eye. A dirty detective who is looking for a chicken run survivor. He is one of the first people to realize Akagi's talents in mahjong, and takes advantage of this to great personal gain. In the manga he also plays the role of narrator. A gamber player who is dumbfounded by Akagi's inability to lose a single hand. He reluctantly calls upon their rep player, Yagi, to defeat the demon kid. The first professional mahjong player that Akagi plays and defeats. He acknowledges Akagi's talents but believes he can defeat Akagi due to his lack of familiarity with the rules. A blind professional mahjong player. Ichikawa was a player that would play by the book, while Akagi played in various ways. He seems to be similar to Akagi, but Akagi denies this and proves it by defeating him. The representative mahjong player for the Kawada Yakuza group, after he was first discovered by Yasuoka. Despite his physical resemblance to Akagi, his playing style is based solely on mathematical calculations and probability, in contrast to Akagi's natural gambling insight and psychological manipulation abilities. He lacks the courage required to be a true gambler, making him unable to be beat Urabe by falling for his strong bluffs. He is eventually killed by Washizu for failing to beat him in Washizu mahjong. The representative mahjong player for the Fujisawa Yakuza group. He and Akagi fought over thirty-two million yen. Urabe was the person responsible for raising the stakes, so when he was defeated, he was brutally mutilated by the Yakuza. An old man who had made a lot of money, and one of the most powerful people in the underground. After building up massive funds from shady dealings in Japan's post-war era, he uses this money to tempt people -especially young people- to bet their lives for the chance to win a large amount of money. He enjoys doing this, so a match between Akagi and Washizu was arranged. Washizu and Akagi played mahjong in an unusual way, of which Washizu calls 'Washizu Mahjong' in which glass tiles replace most of the tiles that make the game different in many ways.